Da Lata is the brainchild of Chris Franck and Patrick Forge. Da Lata blazed a trail for the progressive fusion of Brazilian rhythms with a contemporary dancefloor sensibility on their debut release in 1997, a version of Edu Lobo’s classic “Ponteio” (recorded with engineer/producer Lee Hamblin). This featured the Brazilian vocalist Liliana Chachian and was released on Joe Davis’ then nascent Far Out Recordings. The track won support across the worldwide DJ community crossing over easily between house and more eclectic spinners. Joe Claussell, Francois Kevorkian, Danny Krivit, Gilles Peterson, Rainer Truby, MAW, Jazzanova, KJM were all big supporters. However due to Chris’ involvement with Smoke City the project lay dormant for a few years. Nevertheless, Patrick and Chris had an ace up their sleeve, a song they had demoed back around the time of Ponteio. In 1998 they finally recorded “Pra Manha” with engineer/producer Toni Economides and immediately were signed to Chris Blackwell’s Palm Pictures label. “Pra Manha” was released in 1999 and again garnered huge support worldwide. 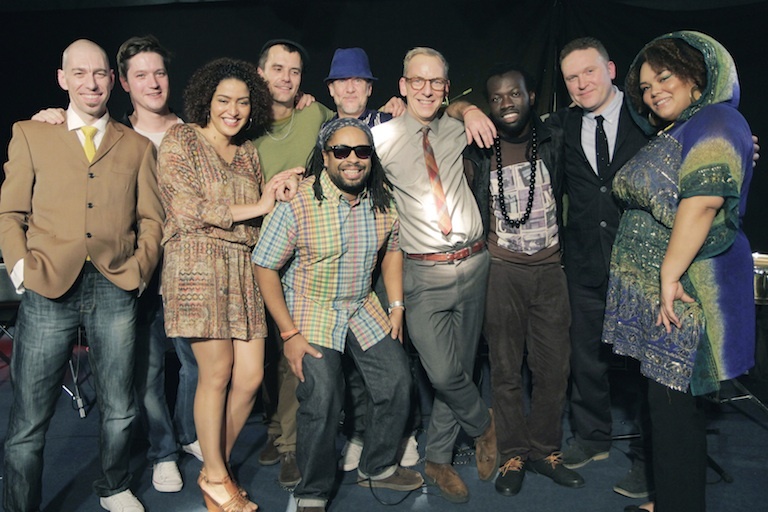 The following year the debut album “Songs From The Tin” featuring Liliana Chachian, percussionist Oli Savill and original Stomp and Batu member Carl Smith was released to critical acclaim. The live band toured the UK, America and Japan, with a memorable show for Body and Soul in Central Park being a notable highlight. Drummer Tristan Banks, keyboard and vocalist Mike Lindup (Level 42) and bass player Andy Lafone added their formidable talents to the line up. Their next release for Palm, “Remixes”, was a compilation of their reworkings of tracks by other artists including Femi Kuti, Bebel Gilberto, Carlinhos Brown and Sly and Robbie which showcased their growing ability to create a synthesis of organic and programmed elements. Chris’ formidable instinct for the groove always ensured the tracks would have that swing and the studio and production skills of Toni Economides ever crucial to the development of the Da Lata sound. Remixes also featured a totally new tune “Golden” and their version of “Ponteio”. Reassembling for their second album, no longer with vocalist Liliana Chachian or percussionist Oli Savill on board, 2003’s “Serious” saw Da Lata diverge into a broader “World” fusion sound with the huge Afro-House groove of the title track featuring cosmic jazz sister Bembé Segué and African singer Mamani Keita leading the way. Baaba Maal, Nina Miranda, Jhelisa Anderson, Pedro Martins and Courtney Dennie also featured as guest vocalists. The second incarnation of the Da Lata live band once again toured extensively to support the release of “Serious”. Festival highlights included Coachella, Glastonbury, North Sea Jazz, Womad and Roskilde. Although much water has passed beneath the bridge between then and now, Da Lata has never been entirely inactive, the intervening years being peppered by the appearance of the odd remix and one-off release. In 2004 “Ronco Da Cuica” a radical reworking of Joao Bosco’s song appeared first in Japan on the Kyoto Jazz Massive 10th anniversary compilation, and later on Danny Krivit’s “In The House” on Defected. Then in 2008 “This Is Not Your Job” a full blooded Afro-House excursion featuring the voice and kora of Diabel Cissokho. In 2011 Chris and Patrick started to knock heads about how a new Da Lata album might take shape even though they were no longer contracted to Palm Pictures, deciding to finance the recording themselves and eventually to take the final leap into self-releasing. 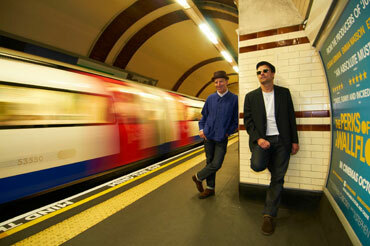 The first taste of the forthcoming album comes in the shape of a single which will be released on a limited edition vinyl 7” and digitally, it’s a version of The Jam’s “Going Underground”, the b-side is a classic Da Lata instrumental “Places We Go”.